Darkstalkers Chronicle: The Chaos Tower for the PSP handheld entertainment system summons the return of Capcom's greatest monster warriors to once again battle for control of the night. This fierce brawler not only encompasses all 18 menacing characters from the five critically acclaimed instalments of the franchise, it is also remastered to include additional content with Wi-Fi functionality. 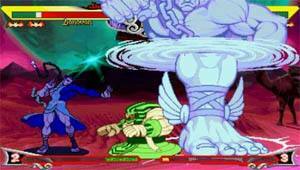 Darkstalkers Chronicle: The Chaos Tower possesses a compelling cast of monster warriors, each possessing their own unique fighting skills and abilities including Demitri Maximoff, the Vampire; Jonathan Talbain, the English Werewolf; Victor von Gerdenheim, the Frankenstein Monster; Lord Raptor, an Australian undead hard rocker; Anakaris, the Mummy; Rikuo, a Brazilian Merman; Sasquatch, the Canadian Snowman; and Felicia, the Cat Woman. Darkstalkers Chronicle: The Chaos Tower is basically an updated version of the Dreamcast title with a few extras thrown in for good measure. Being a 2D fighter, the cast is an eclectic and quite frankly, creative crew of occult-types that, for the most part, are very well designed and thought out. The title offers 18 different characters to choose from each with an assortment of special moves ranging from easy to downright impossible. 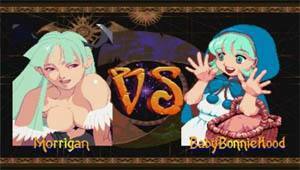 Unlike other 2D fighter games, Darkstalkers offers gamers a twist through the Chaos Tower mode that basically lets you select three different fighters who must fight their way up the tower. This method is also involves strategy on behalf the gamer who must select the most appropriate fighter to fight while the other two fighters slowly regain their health. Apart from the Chaos Tower, gamers can also play traditional melee matches and also challenge their friends via the wi-fi connection of the PSP. Graphically, the characters are all well animated and feature a myriad of colours and some great special effects. All the backgrounds in the game have been professional designed and although don't interact with the main game environment, they do help immerse you into the world of the Darkstalkers Chronicle. The audio of the title also features a very engaging soundtrack and also all the sounds of fighters fighting each other from kicks, punches to special manoeuvres that all sound crisp and clear. In conclusion, the Darkstalkers Chronicle: The Chaos Tower isn't the most adept fighting game on the market at the moment but it does pay a homage to the games of yesterday such as Street Fighter and all those 2D fighter games that are slowly disappearing. With easy to use gameplay, an interesting storyline and great playability, the Darkstalkers Chronicle: the Chaos Tower is a great little fighting game for the PSP.